Abstract：In order to study the flavor attenuation of peanut oil during home storage, five brands of peanut oils were stored for six weeks in simulated home storage condition, the acid value, peroxide value and sensory evaluation of five brands of peanut oils were detected during simulated home storage, while the contents of flavor compounds were analyzed by HS-SPME-GC/MS,and the flavor differences were analyzed by PCA. The results showed that the acid values of the five brands of peanut oils were below the national standard limit without a significant change during simulated home storage,whereas the peroxide values increased with the storage time prolonging, and reached or exceeded the national standard limit after five weeks. The results of sensory evaluation showed that the flavor attenuation of peanut oil could be clearly detected after three weeks simulated home storage, and the rancid odor could be significantly smelled after five weeks. HS-SPME-GC/MS analysis demonstrated that the contents of pyrazines contributed to the roasted flavor and phenylacetaldehyde contributed to the sweet flavor decreased by 4.34-14.13 percentage points and 0.42-1.18 percentage points,respectively during six weeks storage, while the content of aldehydes contributed to the rancid oxidation and decay increased by 2.86-8.03 percentage points. PCA results showed that the flavor compounds in peanut oil had significant differences in 5-6 weeks storage. Therefore, the peanut oils should be eaten up within five weeks after opening. \[1\] TANTI R, BARBUT S, MARANGONI A G, et al. Oil stabilization of natural peanut butter using food grade polymers\[J\]. Food Hydrocoll, 2016, 61: 399-408. \[2\] FRANCO D, RODRIGUEZ-AMADO I, AGREGAN R, et al. 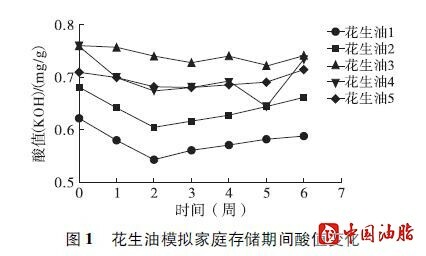 Optimization of antioxidants extraction from peanut skin to prevent oxidative processes during soybean oil storage\[J\]. LWT-Food Sci Technol, 2018, 88: 1-8. \[3\] 邓鹏, 程永强, 薛文通. 油脂氧化及其氧化稳定性测定方法\[J\]. 食品科学，2005, 26（增刊）: 196-199. \[4\] 杨春燕, 厉重先, 荣瑞芬. 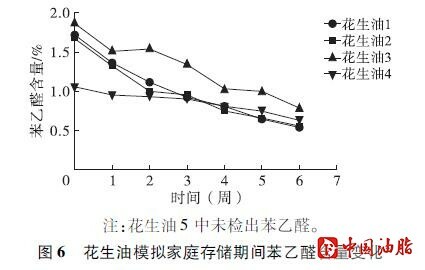 植物油脂的氧化酸败机制及其预防研究\[J\]. 农产品加工（学刊）, 2010 (12): 85-88. \[5\] 张文. 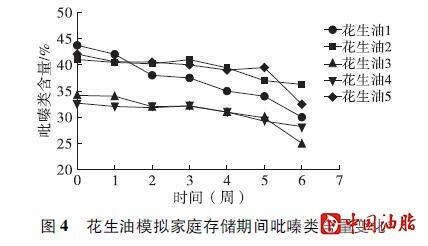 花生油加工和储存过程氧化控制技术的研究\[D\]. 广州：广东工业大学, 2011. \[6\] 范雯婷, 魏法山, 陈霞. 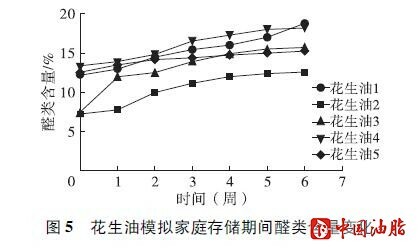 贮藏条件对油脂氧化效果的影响研究\[J\]. 粮食流通技术, 2017, 4(7): 104-107. \[7\] BEN H I, FREITAS F, AMMAR S, et al. Comparison and characterization of volatile compounds as markers of oils stability during frying by HS-SPME-GC/MS and chemometric analysis\[J\]. J Chromatogr B, 2017(11): 322-334. \[8\] 洪振童, 陈洁, 范璐. HS-SPME-GC-MS分析冷榨和热榨葵花籽油的挥发性物质\[J\]. 中国油脂, 2015, 40(2): 90-94. \[9\] 张国文, 邱萍, 倪永年. 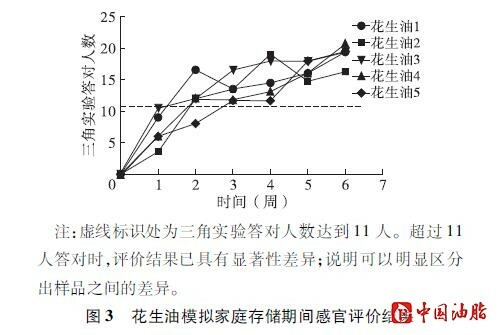 主成分分析法用于食品分类研究\[J\]. 食品科技, 2003(12): 72-75. \[10\] SMITH A L, PERRY J J, MARSHALL J A, et al. Oven, microwave, and combination roasting of peanuts: comparison of inactivation of Salmonella surrogate Enterococcus faecium, color, volatiles, flavor, and lipid oxidation\[J\]. J Food Sci, 2014, 79(8): S1584-S1594. \[11\] SCHIRACK A V, DRAKE M A, SANDERS T H, et al. Characterization of aroma-active compounds in microwave blanched peanuts\[J\]. J Food Sci, 2010, 71(9): C513-C520. \[12\] CHETSCHIK I, GRANVOGL M, SCHIEBERLE P. Comparison of the key aroma compounds in organically grown, raw west-african peanuts (Arachis hypogaea) and in ground, pan-roasted meal produced thereof\[J\]. J Agric Food Chem, 2008, 56(21): 10237-10243. \[13\] CHETSCHIK I, GRANVOGL M, SCHIEBERLE P. Quantitation of key peanut aroma compounds in raw peanuts and pan-roasted peanut meal. Aroma reconstitution and comparison with commercial peanut products\[J\]. J Agric Food Chem, 2010, 58(20): 11018-11026. \[14\] WILLIAMS J E, DUNCAN S E, WILLIAMS R C, et al. Flavor fade in peanuts during short-term storage\[J\]. 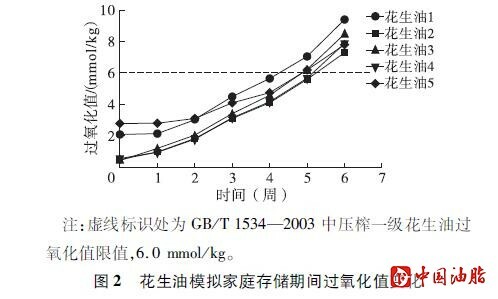 J Food Sci, 2010, 71(3): S265-S269. \[15\] WANG S, ADHIKARI K, HUNG Y. Acceptability and preference drivers of freshly roasted peanuts\[J\]. J Food Sci, 2016, 82(1): 174-184.